Before beginning my tour of Logitech's Lausanne, Switzerland testing facility, Ujesh Desai, general manager of the company's gaming-focused Logitech G products, cracks wise about the irony of testing mice in the basement. Despite Desai's joke, though, the research and development that goes into creating Logitech's mice and keyboards here in Switzerland is anything but funny. The visit to the tech campus, where Logitech crafted their very first mouse in 1981, along with other journalists wasn't meant to sell us on a specific peripheral or branded product, but instead to give an inside peek into the engineering and science behind their line of gaming mice and keyboards. The company's gaming devices may sport sleek designs and pretty, shiny lights, but Logitech wants its customers to know there's much more to their products than cosmetic appeal. To drive this point home, they led us on a lengthy, behind-closed-doors tour that occasionally felt more like a visit to a mad scientist's laboratory. One of our first stops, a room filled with robotic fingers hovering over keyboards, was essentially a torture chamber for WASD keys. Testing the endurance and lifespan of Logitech's Romer-G switch - a new key developed with the pro-gamer in mind - the machines punish the peripherals, jabbing the keys 13 times per second, until they'd survived 70 million clicks. According to Logitech's standards, the last press should feel just as comfortable and responsive as the 70th million. The next room, which happened to contain a monitor looping a video of a keyboard being run over by an SUV, housed a turntable that didn't look unlike the type you'd place a vinyl record on. Rather than playing your old LPs, though, the device spins discs of various surfaces. With a mouse placed on the disc, Logitech's engineers can quickly test its sensors for things like latency, speed and acceleration on just about any imaginable surface. My query as to whether they had a "Mountain Dew-stained desk" surface disc was met with only a smile. While the turntable didn't look out of place among Logitech's walls, the Katapult 2.0 had my wondering if I'd maybe wandered into a NASA testing facility. Powered by compressed air, the machine sports a large mechanical limb that swipes over a semi-circle at speeds my eyes couldn't keep up with. The point of this rigorous test, in layman's terms, is to mimic mouse swipes at extremely high speeds. Acceleration, trajectory and latency are also monitored by the device. The final stop was the anechoic chamber, a foam-padded room constructed in the deepest depths of the facility. Essentially a soundproof room but for wireless signals, the chamber tests the connections of Logitech's unplugged products by isolating radio frequencies. In other words, if your wireless products are suffering slow-down due to interfering Wi-Fi signals, you may want to invest in your own anechoic chamber; it'll only run you about $600,000. 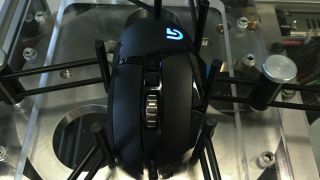 While the in-depth, info-packed tour of Logitech's testing site left me with with a bit of a brain cramp, it also provided a close-up look at the research, development and engineering that goes into the gaming peripherals many of use every day. So, next time you nail a head-shot in Counter Strike: GO, you can thank science, not luck, for your match-winning accomplishment. Head to the next page for a complete photo gallery!